RYANAIR AVIATIONS MOST EXPLOITED AIRLINE WORKFORCE .We are in no way affiliated with Ryanair. : POLICE SHOULD INVESTIGATE RYANAIR'S CEO MICHAEL O'LEARY INSIDER TRADING. POLICE SHOULD INVESTIGATE RYANAIR'S CEO MICHAEL O'LEARY INSIDER TRADING. Should Ryanair's CEO Michael O'Leary be investigated for Insider trading. RYANAIR'S CEO MICHAEL O'LEARY SHOULD BE ARRESTED........ If This is not Insider Trading "THEN WHAT IS" asked Ryanairdontcare Campaign's founder John Foley. 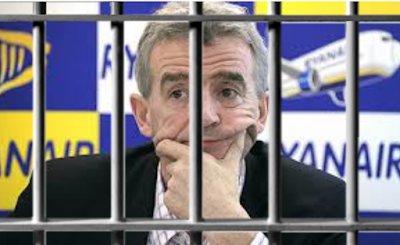 "Insider trading is the trading of a public company's stock or other securities by individuals with access to nonpublic information about the company.Ryanairdontcare Campaign's founder John Foley said "UK POLICE SHOULD INVESTIGATE THIS AND MICHAEL O'LEARY SHOULD BE ARRESTED" RYANAIR'S CEO MICHAEL O'LEARY SHOULD HE BE IN JAIL.????? Asked Ryanairdontcare Campaign's founder John Foley. Michael O'Leary must have new pilot shortages would effect the Ryanair share price.He sold 4 million Ryanair shares weeks prior netting a cool €72 million.Did he have access to nonpublic information about Ryanair before he sold these shares. Is this Insider Trading. "POLICE SHOULD INVESTIGATE THIS"